Funny I found this, because I was just thinking that if (when) the Zombie Armageddon hits, I’d need to fortify my Costco fortress (find your own) with some automatic turrets capable of firing zombie repellent, and what better project to detail building exactly that? InventGeek.com has painstakingly detailed all of their most excellent work that went into building this beauty, and while we have seen a paintball turret pop up over the years, none have even come close to such an elegant execution. 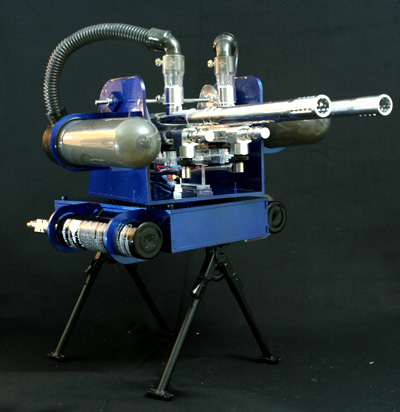 Complete parts lists and even the ability to purchase the acrylic parts are available, so you too can build your very own “Zombie Repellent Paintball Turret” to fortify your “Post-Zombie Armageddon Costco Fortress” (dibs on the one by my office!). This entry was posted on Monday, March 2nd, 2009 at 6:52 pm	and is filed under Featured Projects / Robots, Fun Stuff, Misc, Tutorials. You can follow any responses to this entry through the RSS 2.0 feed. You can leave a response, or trackback from your own site.